The band was formed in 2001 as a three-piece, consisting of Joe Shrewsbury, Paul Wolinski and Iain Armstrong. The line-up of the band has changed somewhat since its initial formation with Feedle (Graham Clarke), a fellow member of the Tefosav collective, joining in March 2003, playing a part in writing the band's first single from The Fall of Math, "Retreat! Retreat! ", and drummer Rob Jones making the band a five-piece before the departure of Armstrong in May and Feedle in July 2003. By the time of the release of their first EP, Stumble.Stop.Repeat, in December 2003, Gareth Hughes had joined on bass guitar, increasing the band to four members. Hughes left around the time of the release of their first album, The Fall of Math. Simon Wright took over on bass guitar. Members of other bands, particularly The Mirimar Disaster and Youthmovies, often join them in their live shows. In their early days the band was known as 65*daysofstatic, though this version (with asterisk) was never used on any release. The origin of the name is unclear, with the band once stating that they took their name from an unreleased John Carpenter film called Stealth Bomber, starring Kurt Russell, that they had formed to create the soundtrack to. However, the lack of any further information regarding the film's existence makes this unlikely. Other theories include that the band took their name from the CIA's 1954 Guatemalan coup d'état during which the CIA put a white book instrument to use according to which 65 days of disabling the communication systems of a nation while spreading propaganda is enough to overthrow a country, or, as put forward by New Statesman, that the name was derived from psychological experiments conducted in the 1950s to 1960s, in which it was found that exposure to 65 days of white noise (or static) would render the listener insane. Much of their early work consists of remixes and mash-ups of mainstream pop artists such as Christina Milian, Natasha Bedingfield and Justin Timberlake. One such mash-up, "White Noise Christmas" (for which a video later appeared on their DVD Volume 3: The Kids Have Eyes), featured on the first Boomselection compilation CD. Some of these were unofficially released on Unreleased/Unreleasable Volume 1 and Volume 2 in 2003 and 2005 respectively. The band also wrote their own music, releasing their first EP, Stumble.Stop.Repeat, in December 2003 on their own label, Dustpunk Records. Recorded at 2fly studios in Sheffield in four days their first album was released on 20 September 2004, to considerable critical praise. To promote the album, the band released a single, "Retreat! Retreat! ", in November 2004, and embarked on two tours, firstly around the time of release and then again in January and February 2005. Their second EP, Hole, was released in March 2005, with the title-track taken from The Fall of Math and the band toured again in April and June of that year, with new material played in the latter tour. During summer 2005, the band returned to the studio, intending to write an EP as a follow-up to The Fall of Math. However, the resulting tracks were ultimately released as their second album in October 2005. At the same time the band released a DVD, the third release in the Unreleased/Unreleasable series, entitled Volume 3: The Kids Have Eyes. This DVD was their final release on Dustpunk Records. To promote this album, 65 embarked on another UK tour in October, their fourth of the year, with support again from YMSS. Although "Radio Protector" was the only track released as a single, a promotional video was also made for "Drove Through Ghosts To Get Here". This video was made by Medlo, their long-time collaborators, and Lord Bunn, an artist responsible for many of their T-shirt designs. "Radio Protector" was the only track from One Time for All Time issued as a single. Released on 7" in February 2006, it was limited to 1500 numbered copies, with the first 1000 having a unique polaroid picture as the artwork. The remaining 500 have a digital copy of the thousandth picture as their artwork. An error in the numbering meant that each record is denoted as being x of 3000 instead of 1500. The band auctioned off the copy numbered 1/3000 on eBay, with the proceeds going to Friends of the Earth. A further UK tour, entitled the "Radio Protector Tour", coincided with this release. This tour was sandwiched between further dates by the band where they supported Hundred Reasons. 65daysofstatic live in Cork in 2007. After touring for most of 2006, 65 returned to the studio in December to record their third LP. Recording was completed shortly before Christmas, with mixing taking place in January 2007. The Destruction of Small Ideas, was released on 30 April 2007. The album has contributions by members of The Mirimar Disaster, Digitonal and Circle Takes the Square. The track "Don't Go Down to Sorrow" was released as a single three weeks before this on 9 April, backed by a new song, "Morning in the Knife Quarter", and a remix of "The Major Cities of the World Are Being Destroyed One by One by the Monsters", a version of which appeared as a B-side on the "Retreat! Retreat!" single. This single was released on 21 March 2007 in Japan, while the album was released there on 23 April. The video for the single was made by Medlo. An EP, The Distant and Mechanised Glow of Eastern European Dance Parties, was released on 7 April 2008, containing four new tracks, two being alternative versions of the title track, itself taken from the 2007 album The Destruction of Small Ideas. An alternate reality game was launched to promote the release, while the band also played their first UK shows for six months. In 2005, they remixed Alkaline Trio's single "Burn" from the album Crimson. The track appears on one 7" vinyl out of a set of two. In the same year, the band also remixed "...Spooks the Horse", a track by Youthmovie Soundtrack Strategies, for inclusion on the reissue of their first album, Hurrah! Another Year, Surely This One Will Be Better Than the Last; The Inexorable March of Progress Will Lead Us All to Happiness. The band embarked on a short tour of the UK and Europe in support of the EP that April, during the break between The Cure's European and American tours, in which they are the main support act. In May and June 2008, they supported The Cure on their North American tour (a tour re-arranged from 2007). A live album, Escape From New York, was released on 20 April 2009 in the UK and 18 August 2009 in the US, featuring recordings from the Madison Square Gardens and Radio City Music Hall gigs. A small tour around the UK to demonstrate new material started in April 2009, followed by a European tour. 65daysofstatic's music was used to score the first radio adaptation of Kurt Vonnegut's novel Slaughterhouse-Five. The adaptation was broadcast on 20 September 2009 by BBC Radio 3 and 15 February 2010 on Radio 4. The band took just seven days to record all the material for their fourth album, We Were Exploding Anyway, released in April 2010. A Japan-only maxi-single, "Weak4", was released prior to the album launch. First reviews of the album state that the band is going further away from the post-rock sound of their beginning and turning toward an electronic style, using more synthesizer and less electric guitar and live drums. It was announced in late 2010 that there would be another release from the band, entitled Heavy Sky EP. This release contains other recordings from the Exploding sessions which hadn't found a place on the album, as well as a cut down edit of "Tiger Girl". The EP was made available to pre-order in a number of bundles, ranging from just the album to a "Super-Deluxe" package including exclusive merchandise. In January 2011 they released the Japanese version including a wordless version of "Come to Me", an alternative version of "Wrong Shape" and a new track, "String Loop". In July 2012 it was announced that a deluxe version of 'We Were Exploding Anyway / Heavy Sky' would be released in Australia through Bird's Robe Records, featuring the additional tracks 'Memorydress' and 'After San Francisco' as well as a new remix of 'Tiger Girl' by Australian instrumental group sleepmakeswaves. In July 2011, the band announced their intention to fund a studio recording of the Silent Running soundtrack by raising $7500 through the crowd-funding website Indie Gogo. By the end of the funding period they had actually raised over $27,000. Silent Running was released in mid-November 2011 as a numbered, limited edition vinyl LP to those Indie Gogo funders who had paid for this option, and as a digital download from the band's website. On 30 July 2013, the band announced via Vimeo that their sixth album would be titled Wild Light, with a release scheduled for September 2013. The album went on to receive critical acclaim (with a score of 82 on Metacritic). Two singles were released from the album, "Prisms" and "Taipei". The band recorded a companion soundtrack for procedural sci-fi exploration title No Man's Sky. Ten original works and six soundscapes composed by 65daysofstatic for the game was released on its soundtrack, No Man's Sky: Music for an Infinite Universe, on August 2016 as digital and retail formats. iam8bit is planning on releasing the soundtrack on a 2 LP-disc vinyl record set alongside the game's release. In October 2017, the band announced a new work entitled "Decomposition Theory", featuring algorithmic music and live coding techniques, with the first performances taking place as part of Sheffield's Algomech Festival during November 2017. In Autumn 2018, the band plan to take the project on tour across the UK and Europe. The band members have repeatedly stated that they enjoy playing live. Towards the end of 2005, in a mail-out to subscribers of their newsletter, they said that they were "a little disappointed" only to have played 91 shows in that year. They have received critical acclaim from independent music websites, such as Drowned in Sound, for their live shows. In 2006, they played to their biggest crowd yet at that year's Summer Sonic festival in Japan, alongside such bands as Metallica, Lostprophets, Linkin Park, and Deftones. 2006 also saw their first European tour, playing in Belgium, The Netherlands, Germany, Italy and France. They have performed frequently with live visuals from Medlo, long-term collaborators with the band. They made guest appearances on the band's 2006 and 2007 UK tours, and also produced the majority of their music videos, including "Radio Protector", "Drove Through Ghosts to Get Here" and "Don't Go Down to Sorrow". Having played their first American shows at SXSW in March 2007, they embarked on their first American tour supporting Fear Before the March of Flames in July and August 2007. Following that was "The Destruction of Small Ideas Tour Part 2", which saw them play venues across Ireland, the UK, and several other European countries. In August 2012, the band announced their first ever Australian show, as part of the 2012 Peat's Ridge Festival in December. Details of a full Australian tour were then announced, with the band visiting Sydney, Brisbane, Melbourne and Perth in January 2013. Fans of the band are known as '65kids', although the band has also been known to use the phrase. The name was also used by now defunct fansite 65kids.com which hosted "torrents, music videos, unreleasable pop mashup albums, remixes, dvds, tour diaries, live recordings, and radio sessions". ^ "65daysofstatic". Monotreme Records. Archived from the original on 5 December 2014. Retrieved 13 June 2014. ^ Blatchford, Thomas (20 September 2004). "65daysofstatic - The Fall Of Math". Drowned in Sound. Retrieved 13 June 2014. ^ "65daysofstatic - No Man's Sky". 65daysofstatic. 5 December 2014. Retrieved 6 December 2014. ^ a b "65daysofstatic". Drowned in Sound. Archived from the original on 9 February 2007. Retrieved 30 December 2015. 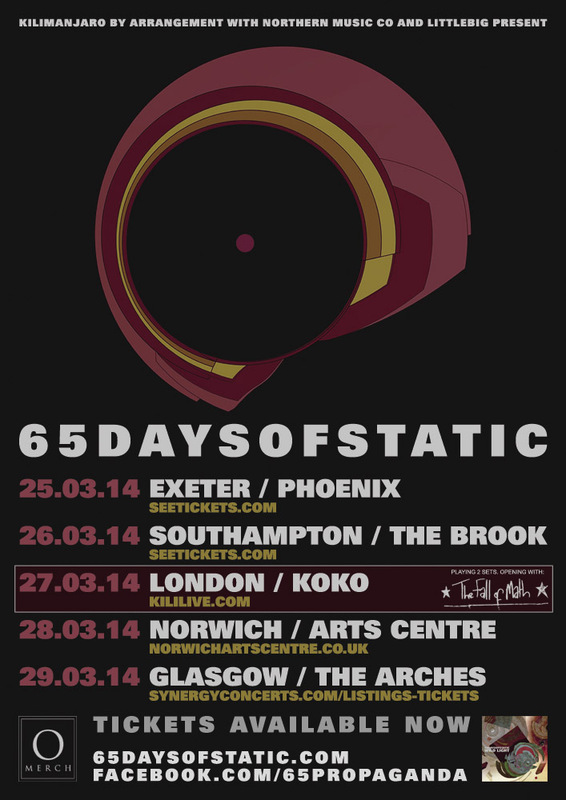 ^ "Interview: Joe Shrewsbury of 65daysofstatic". The AU Review. Retrieved 23 September 2015. ^ "65daysofstatic". Everything2.com. 2015. Retrieved 23 September 2015. ^ Hancox, Dan (24 October 2005). "The Download". New Statesman. Archived from the original on 4 August 2008. Retrieved 4 August 2008. ^ "Happy Accidents". 65daysofstatic.com. 8 January 2007. Archived from the original on 16 March 2007. Retrieved 4 August 2008. ^ a b "Till the fuel runs dry". 65daysofstatic.com. 1 February 2008. Archived from the original on 5 February 2008. Retrieved 4 August 2008. ^ Diver, Mike (20 April 2009). "65daysofstatic - Escape From New York". Clash Magazine. Retrieved 23 September 2015. ^ "Slaughterhouse 65". Goatwriter. 11 September 2009. Retrieved 23 September 2015. ^ 65HQ (3 February 2010). "65Propaganda 030210: Schlachthof Fünf on Radio Vier". 65daysofstatic.com. Retrieved 23 September 2015. ^ 65HQ (3 March 2010). "65Propaganda030310 : You know, sha-la-la-la-la, sha-la-la-la-la, neither one regretted a thing". 65daysofstatic.com. Retrieved 23 September 2015. ^ 65HQ (12 March 2010). "Album artwork". 65daysofstatic.com. Retrieved 23 September 2015. ^ "Review 65dayofstatic "We Were Exploding Anyway"". getaddicted.org (in German). Archived from the original on 9 April 2010. ^ "Taipei". Vimeo.com. 30 July 2013. Retrieved 30 July 2013. ^ Yin-Poole, Wesley (8 April 2016). "No Man's Sky's cool soundtrack comes out alongside the game". Eurogamer. Retrieved 8 April 2016. ^ Frank, Allegra (3 March 2016). "No Man's Sky getting special $150 box set from iam8bit". Polygon. Retrieved 3 March 2016. ^ Murray, Robin (5 September 2017). "65daysofstatic 65daysofstatic Announce 'Decomposition Theory' Project". ClashMusic. Retrieved 2 July 2018. ^ 65daysofstatic (2 July 2018). "Decomposition Theory European and UK Dates". 65daysofstatic. Retrieved 2 July 2018. ^ "Canadian Tour". marchofflames.com. Archived from the original on 21 June 2008. Retrieved 4 August 2008. ^ 65HQ (3 March 2010). "65Propaganda030310 : 65's Cancelled Asian Shows". 65daysofstatic.com. Retrieved 23 September 2015. ^ "65daysofstatic live soundtrack to "Silent Running"". sensoria.org.uk. Archived from the original on 23 September 2015. Retrieved 23 September 2015. ^ "65daysofstatic Australian tour - January 2013 - w/sleepmakeswaves + guests". Facebook. Retrieved 23 September 2015. ^ "March 2014 Tour Poster". 65daysofstatic.com. Archived from the original on 31 October 2013. ^ "65kids.com". Archived from the original on 6 November 2011. Wikimedia Commons has media related to 65daysofstatic.